PSNews – Intelligence and enthusiasm are the two outstanding qualities of Senior Lieutenant Le Giang Phong, an officer at the Staff Division under the Dong Nai Provincial Police Department. Being keen on research, he has had many initiatives in applying information technology to work, contributing to releasing officers and soldiers from hard manual labor. Phong is a former student of Luong The Vinh High School for Gifted Students (Bien Hoa City, Dong Nai). After graduating from high school, he studied at the Public Security University. Phong shared that joining the Public Security Forces had always been his dream from childhood. The current working environment in the Public Security Forces has helped Phong train and develop himself comprehensively. With his big passion for information technology, during his time at the Public Security University, Phong was a member of the Informatics Olympic team. He received a third prize at the Informatics Olympiad for Vietnamese students, and his team also won a second prize of the Association of Computing Machinery International Collegiate Programming Contest (ACM-ICPC). Currently, Senior Lieutenant Le Giang Phong works at the Legal Section of the Staff Division under the Dong Nai Provincial Police Department. The daily work requires him to constantly update and sum-up many legal documents as well as deal with many reports. 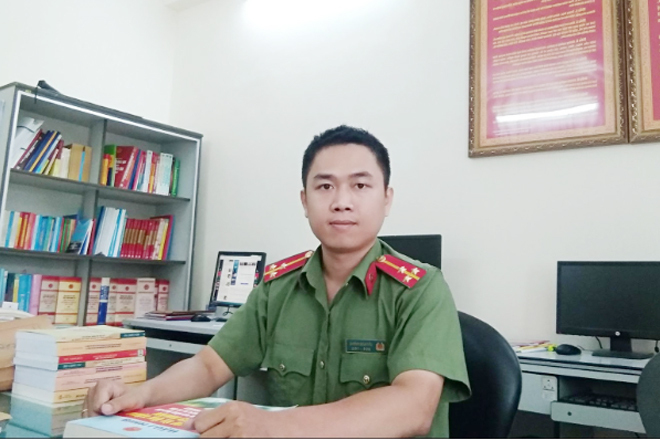 From his working requirements and with his passion for information technology, Senior Lieutenant Le Giang Phong proposed ideas and participated directly in building software specialized for management of legal documents. This scientific project has been appraised and approved, and will be put into operation in early 2019. Senior Lieutenant Le Giang Phong said that the legal document management software will help store, search, retrieve and process documents in a fast and simple way. In his free time, Phong likes reading books, especially historical and scientific books. In 2015, he won a third prize of the Dong Nai Provincial Party Committee History Contest. In 2017, he received a Certificate of Merit from the Minister of Public Security for his outstanding achievements in ensuring political security and social order. In 2018, his team won the first prize of the contest "Youth of Dong Nai Police - Bravery and Humanity to serving people". With his great effort for study and innovation, in 2016 Phong was granted a scholarship by the Indian Technical and Economic Cooperation to study information technology application in law enforcement in India. Returning home after the course, Phong continues applying the acquired knowledge to his professional work, contributing to ensuring security and social order in Dong Nai province.